This is so sneaky. As soon as I saw this recipe I knew I had to make it. I'm always searching for ways to incorporate veggies into things my girls will eat. They even thought (until I clued them in on the carrots) that it was mac & cheese! And since I love garlic (nearly) as much as I love chocolate, this hits the spot for the adults in this house, too! I have a little container herb garden on my deck and thyme is making its debut this year. Last year I grew basil, rosemary and mint (mainly for Mojito's, of course). I was so excited to be able to pick a few sprigs of fresh thyme for this recipe, but dried would work just as well. 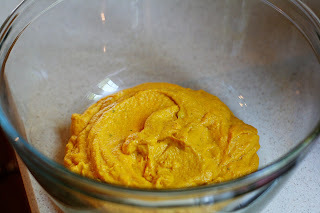 I almost didn't include this picture of the carrot puree, mostly because it just looks like baby food. But I wanted to show how creamy this really is! All that heavy cream is doing its job. Once the carrots are roasted and pureed, they take on a sweet and smooth flavor. You could even turn this into an entree by adding bacon or diced chicken. 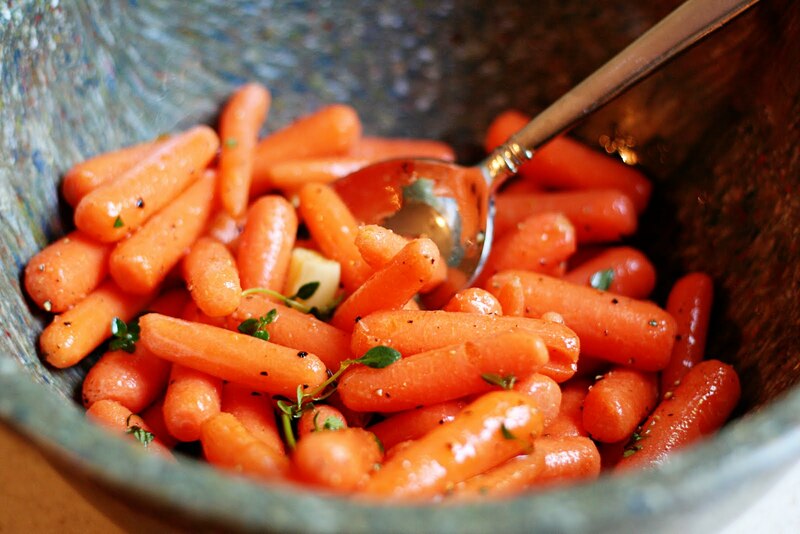 In a large bowl, combine carrots, garlic, olive oil, and thyme. Season with salt and pepper. Spread on a roasting pan and place in a 400 degree oven. 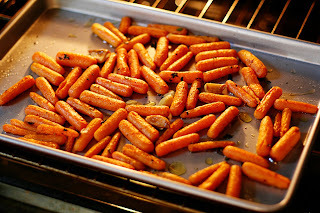 Bake about 45 minutes, or until carrots are tender. Toss once or twice during cooking to make sure the carrots cook evenly. Cook the pasta according to package directions. 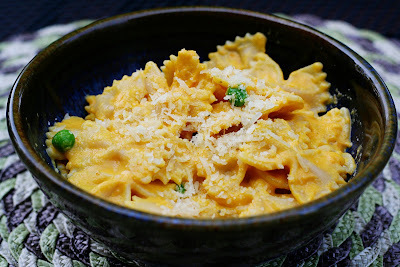 While the pasta is cooking make the carrot cream. 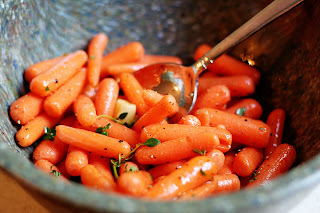 In a blender, puree the carrots and garlic together with the heavy cream and parmesan cheese until smooth. Place in a large bowl. Toss in the peas and stir. When pasta is done, drain and add to the bowl with the carrot puree. Toss gently to coat. Slowly add the milk until all the pasta is evenly coated with the puree and is a nice consistency. I LOVE the looks of this! I'm a big mac and cheese person--but also a big veggie person. I can't wait to try it!